For every long-absent PC series, a capable pretender to provide a stopgap for its gagging players. X-Com had the UFO series in its stead, until Firaxis made all other efforts redundant. And you might have predicted the same for Egosoft’s X series now that Elite: Dangerous and Star Citizen are within range of our interplanetary radar equipment. But then that first X Rebirth trailer arrived in August and set jaws to drop. Everything about it looked absolutely vital – a nether place of colossal, rotating vessels and fully-explorable space stations. And tiny you, in the middle of it all. You’ll want to hear a bit about the conception of X Rebirth, which we’re told is the culmination of seven years’ work and a realisation Egosoft had nearly a decade ago. “All prior X Games before X Rebirth represent the layering upon layering of additional features, many of which were never part of the game’s original design,” wrote the developers. 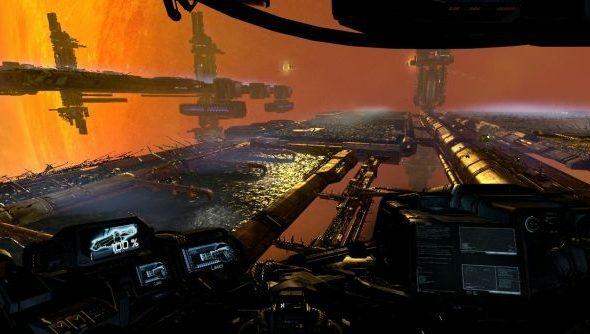 “Responding to the large community of space simulation fans that flocked to X: Beyond the Frontier, the developers at Egosoft obliged the plea for more – more freedom, more ships, more realism, and more things to do. “However, even before the 2005 release of X3: Reunion, it had become clear that this development methodology had made the series inherently complicated and unnecessarily impenetrable for any outsider who had not begun playing the X Series games from the very start. And just in the nick of time. X Rebirth will beat both Chris Roberts and David Braben to the landing bay for its November 19 release date, ready to absorb renewed public excitement for the potential of the space sim genre. Will you be there, waiting to board?